Self-awareness is key to good mental and emotional wellbeing. IRUPA, in partnership with Zurich through the Tackle Your Feelings campaign, is equipping people with the tools and resources to reach their wellbeing potential. IRUPA have come up with a useful tool where people can take a self-awareness test to see how they are functioning mentally and emotionally across different areas of their lives. When the results of the test are compiled, a number of tips and resources are given that can support an individual as they set about resolving mental and emotional issues. Self-awareness is key to good mental and emotional wellbeing. If you want to become more resilient in dealing with stress and resolving difficult emotions then you need to understand you own patterns and habits," Créde Sheehy-Kelly, Tackle Your Feelings (TYF) Campaign Manager says. According to Sheehy-Kelly the first step is recognising when you are feeling under pressure. "Simple as this sounds, many people don't actually realise when they are feeling down or are stressed out and it's not until it builds up into a crisis point that they realise that the stress has been building all along." The TYF test is a self-awareness tool aimed at helping people connect with how they are feeling. "At the end of the test you'll be directed to an 'emotional dashboard' which will point out one area in your life that is going really well for you at the moment and one life area that requires your attention." Sheehy-Kelly explains. "This will help you to get the most out of the tips and resources section." Tackle Your Feelings seeks to emphasise the importance of preventative measures in maintaining good mental wellbeing. By asking people to be honest with themselves about how they are feeling and to take appropriate action, the campaign aims to encourage people to resolve emotional challenges before they escalate into a crisis. Elaine Hayes, who is driving Zurich's Corporate Responsibility agenda in Ireland adds: "As a large employer in Ireland we've seen first-hand the positive difference that TYF can make; both in addressing the stigma of speaking about mental health and in encouraging people to proactively look after their mental wellbeing." To see the areas in your life where you are thriving and those that need some attention, take the self-awareness test. It only takes five minutes and will help direct you to the most relevant resources to help you reach you full emotional and mental wellbeing potential. 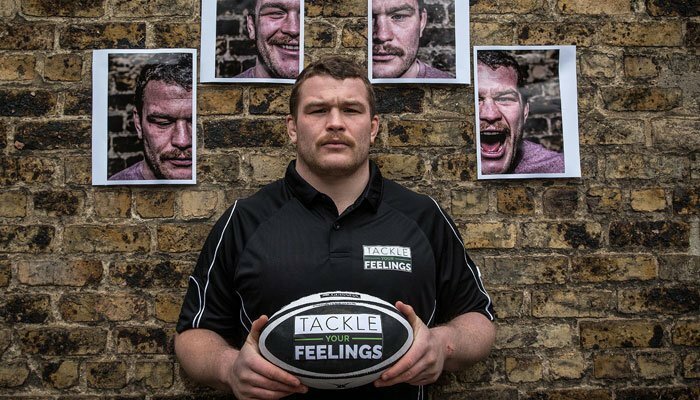 Tackle Your Feelings is a three year partnership between Zurich and the Irish Rugby Union Players Association (IRUPA) aimed at encouraging people to take preventative measures to look after and maintain their mental and emotional wellbeing. To hear from the TYF Ambassadors click here and to see how you are feeling across different areas of your life, take the self-awareness test.